The Go Green Expo in Atlanta I went to was chock full of interesting green products, services, and solutions for your home, your lifestyle — and then some. My interest was focused on home building products and services (of course) and anything that would improve my lifestyle, while at the same time reduce my impact on the environment. Basically, like many of you out there, I’m trying to live greener as time goes on. This means putting into practice all of the green home building products and services at my disposal whenever possible. One of the products on display that interested me a great deal was Eco Seal. It’s a ceramic coating applied to the exterior of your house (also known as ceramic paint or insulating paint). Ceramic coating is a remarkable product that comes with a 25-year transferable warranty and has a lot going for it — besides the longevity aspect. 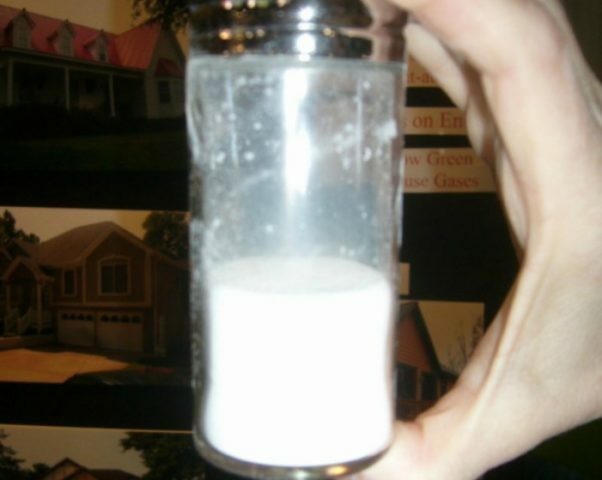 Ceramic coatings used as an insulating paint on homes and buildings have been around for quite some time now (30+ years) under a multitude of brand names. So it would seem that if they didn’t perform as promised, you would have read about it somewhere by now. There seem to be a few skeptics out there that can’t seem to wrap their minds around the insulating properties and benefits of ceramic paint and exactly how it works. Vickie gave me a hands-on demonstration of the waterproof properties of EcoSeal’s adhesive primer sealer (first coat of the application). She used a folded paper towel that had been previously coated with the primer sealer, allowed to dry, and then placed it in a bowl of water. The paper towel was still intact. Cool! I was also given the opportunity to see and touch one of Eco Seal’s key ingredients of the paint — the ceramic microspheres. It was a bizarre tactile sensation. I was then invited to stick my finger in the vial of Eco Seal microspheres. I was slightly hesitant, but went with it. I didn’t feel a thing. I had to look at my finger through the jar to realize that it had been totally surrounded by the microspheres. It was weird, weird stuff. She then demonstrated the elasticity of EcoSeal by giving me a 6″ x 6″ square of the ceramic paint strip that had been peeled away in a nice sheet. It was like a rubber membrane that could be stretched in any direction and still retain its original shape! This stuff is especially recommended for coastal residents for its corrosion resistance and salt tolerance. EcoSeal has been proven to provide better protection than Rustoleum, the industry standard in that category. Eco Seal ceramic coating has its own formula that has undergone independent testing by BASF, 3M, and The American Society for Testing and Materials. 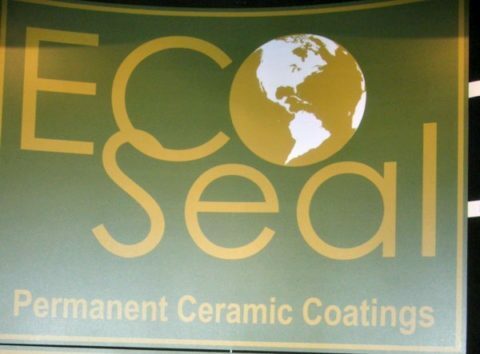 I find it interesting that Eco Seal primarily stresses the longevity of the product. Then they follow that with the other extraordinary benefits of ceramic paint within their literature. Longevity – It comes with a 25-year transferable warranty from chipping, peeling, or flaking. “Never paint again” is the big selling point in large bold letters in their literature. Class A fire and smoke rating – That’s a strong rating! Mold and mildew resistant – It’s also less likely for wood rot to occur due to the properties of the Eco Seal adhesive primer sealer. It’s sticky — I touched a small piece of siding used for demonstration purposes. It’s permanent – It permanently bonds with any paintable surface. Flexibility – It expands and contracts with changing temperatures. This is key to the warranty, in my opinion. Breathable – It has a breathability (perm) rating of 32.7 — that simply means that it keeps water particles out but allows water vapor to escape from the interior, thus reducing the chances of mold and mildew occurring. Lower VOC’s – It rates at 81.6 g/l compared to approximately 200 g/l for traditional house paint. Variety of colors to choose from – It’s just like regular paint in that way. Cost – On the front end, it’s about 2 to 3 times more expensive than what you would pay for a typical paint job on your house — per Vickie at Eco Seal. The key words there are “on the front end.” But if you think about it, that’s not really a negative because once this product is applied, you’re good for a long while — guaranteed. Choosing a color – You better choose a color that you’re going to be happy with for a very, very long time! I encourage you to read the Treehugger article on ceramic insulating paint along with the insightful and thought-provoking comments from readers that follow the article. Great discussion and questions are raised there — regarding thermodynamics and more. Why Is Eco Seal Considered A Green Product? Lower VOC’s – Means lower greenhouse gas emissions. Low-E Rating – The ceramic microspheres reflect up to 90% of the sun’s rays — therefore, reducing the surface temperature of your siding. It’s because of this that Eco Seal has a Low-E rating (same as energy efficient windows). This will save energy (and money) right out of the gate. Saves Trees – The primer bonds with the substrate, forming a permanent seal from water. That means you won’t need to replace any rotten boards on your home for a long time. Landfill Friendly – If disposal is required, it’s “landfill friendly”. (I’d like to see more data on this claim by Eco Seal). Okay…in my opinion, Eco Seal looks like an excellent product with great attributes (based on the test results I read). It’s been proven to work by well-known independent laboratories — so I feel comfortable recommending this product and other ceramic coatings like it. However, I will have to reserve judgement on this ceramic paint product until further notice — due to the enormous amount of research required to come to any sort of personal conclusion. For example, it would be great to go back to the homeowners 5 years after it has been applied to see if their energy bills have been reduced by the amount that these manufacturers claim. Upon further research, I DO NOT feel comfortable recommending a ceramic coating for use as a house paint. As a roof paint possibly — but not a house paint. Because the laws of physics dictate that some of the claims made for this product are not possible — at least not to the extent to which they are claimed. I’m not afraid to admit when I’m wrong and this looks like one of those times. A reader here at the Homebuilding Guide has given me food for thought on this subject by challenging the claims made by the manufacturer of this product (and others like it) — in ways that are, honestly, best left to scientists and engineers to prove or disprove. I can only absorb their findings and report them here — which I plan to do in the future. The best I can do right now is to tell anyone who may be interested in covering their home with a ceramic coating, is basically buyer beware. I know I’ve given you a lot to think about when it comes to ceramic coatings. Basically, I’ve laid out pros and cons of using a ceramic coating for the exterior of your home and the ways that it benefits the environment. After reading this, you should be armed with enough information to have a conversation with your contractor to see if using a ceramic coating is right for your home project. If you’re into using eco-friendly home products and doing things in ways that benefit the environment, we have a whole series of articles on eco friendly homebuilding. How Big Is The Carbon Footprint Of Your Home? I wrote an article about another brand of ceramic paint called Insuladd — it’s a similar product with outstanding characteristics claimed by the maker. Bob Vila shares his point-of-view on ceramic coatings and how they work. HY-TECH is another company that sells ceramic paint and additives with reasons why their brand is the real deal. The Spruce shares some interesting facts about low-VOC ceramic wall paint, and other ceramic paint manufacturers.